Mason jars are a staple in the natural country home. They're used for canning and storing food. They're used for keeping treasured keepsakes safe and tidy. In a pinch, they're used for serving lemonade or as a fun milk pitcher. Mason jars can also be used for prettying up and decorating purposes. Add a few flowers and they become an adorable vase. Add a bit of ribbon, lace or fabric and they become gorgeous decorative pieces in your home. Did you know that Mason jars are also a new and increasingly popular theme for country rustic weddings? With that in mind, they're also the perfect theme choice for a fun casual chic bridal shower. 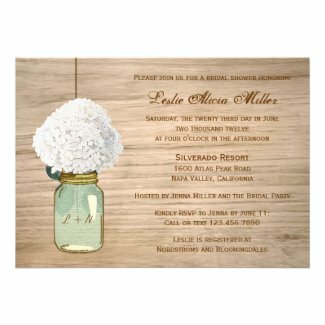 If you're planning a country rustic bridal shower with Mason jars as the main theme here's a few ways you can use them. Filled with wildflowers on the table/s. For serving hot and cold beverages. Filled with candy on the buffet table. Filled with goodies as party favors. Filled with dips and sauces. 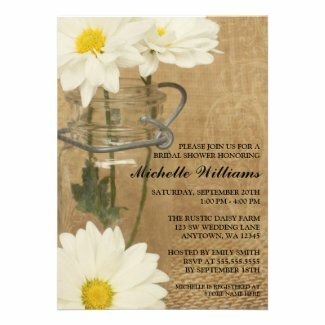 Here's 10 of my favorite bridal shower invitations that feature Mason jars in the design. Each has it's own personal charm. You'll find both photographic and pastel or water color designs featuring floral arrangements, butterflies, Fireflies and more in all of the colors of the rainbow. Choose the perfect one to set the tone of your shower or to match the bride's color scheme. By clicking on the images you can see a larger image, get a look at the flip side, and learn more about each invitation. and some that feature different flowers than the ones shown here. 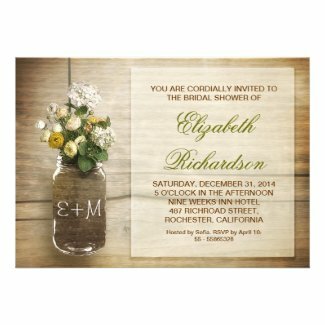 Visit Mason Jar Bridal Shower Invitations to see them all. Have you got a great idea for a mason jar theme bridal shower? P.S. All photos on this post (except for the invites) appear through a creative commons license. A huge thank you to all of the photographers who made their beautiful work available for us to enjoy. Click on each photo to be taken to it's original source.